Number 48. Like any other football team, the number 48 jersey is given to a player on the team. For Woodland’s football team, the number 48 jersey has a special story. Dante DiRubba, a senior at Woodland, and a part of Woodland’s football team, joined the team as a freshmen. DiRubba was a normal part of the team; he participated in practice every day and competed in games, until one game his sophomore year. It was one regular autumn day, a home game against Wolcott. Like any other game, DiRubba was given the ball to carry upfield when he collided with a Wolcott player and hyper flexed his neck. As a result, DiRubba was faced with a number of restrictions to his everyday life, and this included football. Like any other athlete in this position, DiRubba was faced with a choice. He could either remain a member of the team, despite not being able to play, or retire as a player. Not wanting to cut his bond with football and the team, DiRubba made the decision to stay. With making the decision to stay, DiRubba has earned a spot on the team that no one else could fill. By going to every single practice and every game, the boys know they can count on him, and DiRubba knows he can count on his team. After having a life changing injury, it took DiRubba a while to get used to his new lifestyle of restrictions. Although DiRubba’s outlook on the situation can be negative, he chooses to look at the positive. DiRubba chooses to look at and appreciate the family bond he has with the boys, and knows he has people there for him. “Everybody on that team is my family, so I love sticking with my family,” DiRubba explains. Of course there can be setbacks to this situation. Having a driving passion for football and not being able to play is something that greatly affects DiRubba. “It makes me antsy and a little sad that I can’t be playing on the field with my team, especially since we are getting a lot better now. Whenever I go to the games and I see Edit breakaway run, my legs just start jittering because I just want to be out there with the team,” DiRubba admits. Not many athletes would stick to the commitment that DiRubba did, which makes the number 48 jersey so special. It represents commitment and perseverance. DiRubba connects it all back to sticking with what he loves. DiRubba is not the only student in the school that shares this experience. Senior Zack Arzano was also put in a situation where he could not participate in sports. Due to a heart condition called “familial dilated cardiomyopathy,” Arzano cannot play football due to this, but he is connected to the team in a different way. Arzano realizes this is the closest he could ever get to the team. He takes DiRubba’s stance on the situation and feels that staying close with the team is beneficial to him because he is so passionate on the sport, and wants to be involved on whatever level he can be. The attention from the crowd when attending Woodland football games, may be on the players on the field, but what the crowd does not realize is the people behind the scenes that don’t get the opportunity to throw a game-winning touchdown or run 60 yards for a play. 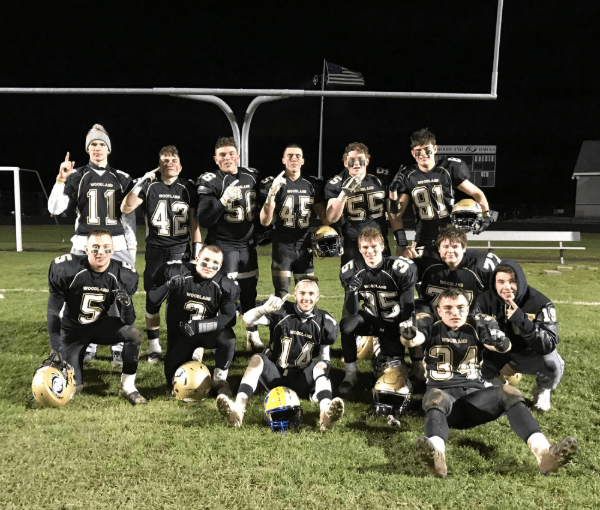 48 is more than just a number for the boys on the Woodland football team and for the students of Woodland Regional High School. Dirubba and Arzano may not be making plays on the field, but they have an impact on the team in a different way, which is equally as special.